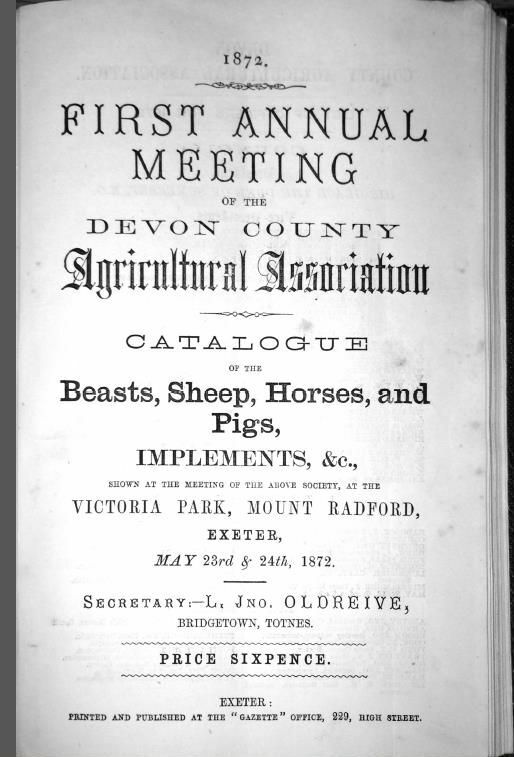 The Devon County Agricultural Association (DCAA) has played a leading role in the development of agriculture and the rural economy in Devon since its formation in 1872. Our flagship event is the Devon County Show, staged every third week of May at Westpoint near Exeter, as a gigantic shop window for local agriculture, horticulture, food and drink, rural crafts and forestry. The DCAA is accountable to the membership through its Council, with strategic decision-making delegated to a small Board of Directors. It is a company limited by guarantee and a registered charity. It owns a subsidiary company, Westpoint Centre (Devon) Ltd, that is charged with generating income from DCAA buildings and land during the remaining 11 months of the year. The very first Devon County Show was held at Victoria Park in Exeter on May 23 and 24 1872. It was, and remains, the flagship event of the Devon County Agricultural Association, which had been re-formed in January of that year, after 21 years of being merged with the Bath and West. Despite a torrential downpour, which almost literally washed the President’s luncheon guests out of his marquee, that first show was a success. Over 25,000 people attended to admire the 500 livestock on show, and marvel at more than 800 machinery exhibits. However, Exeter would not become the show’s permanent home until many years later. The DCAA’s mission was to use the show to promote and encourage better farming and so strengthen Devon’s rural economy. That meant taking it to every corner of the county. Between 1872 and 1956, when the first permanent site, at Whipton, was acquired, the Show visited 16 different locations, from Axminster to Bideford. Setting up the show was a major operation. Up until the 1920s, when motorised transport became generally available, everything had to be moved either by railway or horsepower, although at least the organisers didn’t have to worry too much about the state of the car parks if the weather was bad! The move to Whipton was engineered by a man who would become a Devon County Show legend, John Hocken. He was at the helm for 30 years from that first Whipton show in 1956, and succeeded in both transforming the showground through the construction of an impressive array of permanent buildings, and in establishing the Devon County as one of England’s major agricultural events. But eventually, the always rather cramped Whipton site was outgrown and in 1990, the show moved to its new permanent site, on what had been Ivington Farm, but which quickly became Westpoint. It was a brave move, involving a daunting bank loan, but it has paid off handsomely. Today’s Devon County Show regularly attracts crowds of more than 90,000 over the three days, and there is always a waiting list for trade stands. The Devon County Show is the flagship event of the DCAA. The DCAA's subsidiary company, Westpoint Centre (Devon) Ltd, lets the buildings and land at Westpoint to external organisations for exhibitions, events, conferences and entertainment. The DCAA supports Farm Wise Devon (connecting children to the sources of their food) and the specialist one-day show, Agrifest South West. The DCAA awards bursaries to two students at Bicton College annually.